The voracious reader didn't see many stories about Muslims growing up, so she wrote the novel Ayesha at Last. 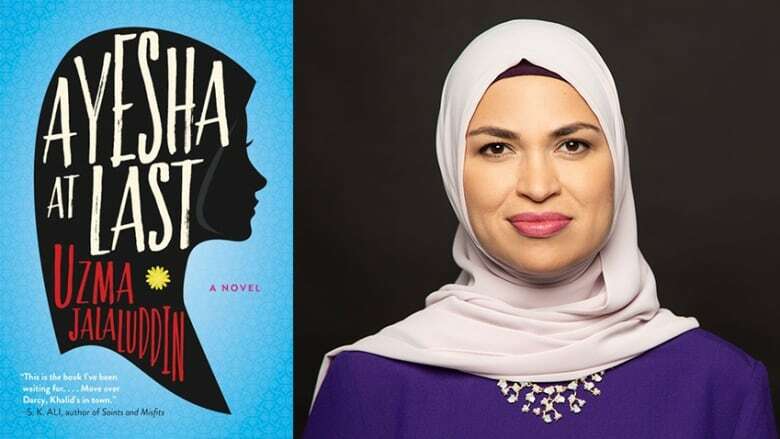 Set in a tight-knit Muslim community in Toronto, Uzma Jalaluddin's debut novel Ayesha at Last is a love story in the vein of Jane Austen's classic novel Pride and Prejudice. Ayesha, a teacher who dreams of being a poet, belongs to a rambunctious family and is surprised when she finds herself attracted to a traditional, conservative young man named Khalid. "My main character Ayesha is a 20-something young woman who lives with her boisterous extended family in the east end of Toronto and she has a dream: she wants to be a spoken word poet. She's especially close to her younger cousin Hafsa, who's about 20. Hafsa plays the Lydia Bennet to Ayesha's Lizzie Bennet. Khalid, who is the Mr. Darcy character, dresses in very traditional, conservative Muslim gear. So you see him walking down the street wearing a long, white robe, a skullcap on his head and a long beard. When the average person would see him, they'd find him very intimidating. But at his heart, he's a romantic and he's determined to be very traditional about his love life. This story begins with this young man, who's been living his life a certain way and this young woman, who has been living her life in a certain way, and they meet at a crossroads in their lives. And, of course, romantic sparks happen." "I love to laugh and I wanted to write a story that isn't the sad immigrant story, which so often takes over the narrative about marginalized communities. I wanted to explore the happy parts. My book has a lot of drama — it does have a lot of serious issues of identity — but it also focuses on love. One of the things I've always loved about Jane Austen's work is that I, as a modern-day Canadian Muslim South Asian woman, could relate to something that was written by a white woman in Britain 200 years ago. I think she deals with universal themes of love and longing. Another thing I love about Jane Austen is that she's such a inclusive author. I always feel like I'm in on the joke, which is amazing." "Growing up, I was a voracious reader. I used to read all the time, but I didn't see my stories being represented as a Muslim, as a South Asian, as a second-generation immigrant. When I set out to write my own first novel, I wanted to humanize and write in a very inclusive way about a community that most people are not familiar with. My hope is that when my readers pick up Ayesha at Last for the first time that they immerse themselves in a world that they might find really unique but also very familiar. "I also hope they will be entertained. When I set out to write a book, I wanted to write a book that people would find very hard to put down and also make them think about their own first love. I wanted them to think, 'You know, I never thought about this community in this way.'" Uzma Jalaluddin's comments have been edited for clarity and length.